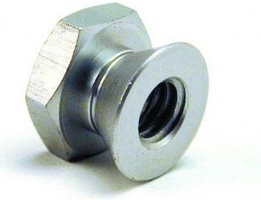 Protect your new signs from being tampered with and easily stolen with these all aluminum break away nuts. Sold by the piece. Use with our HW-BOW2 One Way Bolts for total theft protection! Use a wrench to tighten the nut. When the nut is tight, continue to firmly twist the nut until the hex head breaks off leaving the 5/16" smooth, vandal proof tapered nut behind. Bolts sold separately.